The lobby of New York City’s Palladium was filled with punks. Ripped T-shirts, dog collars and chains, safety pins, plastic sunglasses from Woolworth’s – you name it, they wore it. Halloween? Nope, too early. This was the night of Iggy Pop’s New York concert appearance, and everyone was all decked out for the occasion! Most of us had recently seen Iggy here on March 18th at the start of The Idiot, tour with Bowie on keyboards, and Blondie as the opening act. How lucky are we to be seeing him again just seven months later! Opening act – the Ramones. Those blitzkreig boppers kept everyone jumping on their seats. The Ramones did their usual short set, intro including ‘Sheena is a Punk Rocker’, which even made the charts! They did some new tunes; ‘Rockaway Beach’ and ‘Here Today Gone Tomorrow’ during which there was an outburst in the third row. Patti Smith was fighting off five ushers at once, punching and yelling until she finally climbed over our heads and into a front row seat. 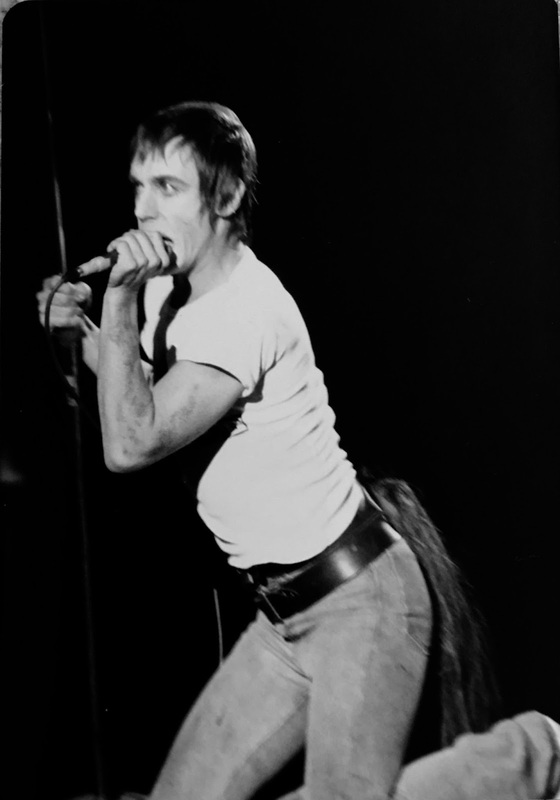 Then came Iggy, prancing out in patched jeans and white T-shirt, one black shoe and one white one, and wearing a horse’s tail as he sang ‘Sixteen’. Most songs were from his latest RCA album Lust For Life; ‘The Passenger’. ‘Some Weird Sin’ (which he sang from inside a black bag lying on the floor), and ‘Fall in Love With Me’ sporting an army helmet and smashing a chair at the end. Iggy also did ‘Nightclubbing’ from his previous LP The Idiot, only this time with a new twist. He sang it in German while climbing stacks of amplifiers. His voice was cold, alien – almost frozen. We were treated to some Stooges songs. ‘I Wanna Be Your Dog’ was snarled out by Iggy who was on all fours, growling and howling his way into our hearts. A rendition of ‘Raw Power’ was inevitable. ‘I Got a Right’ was amazing (the only recording of which is a mono 45 made from James Williamson’s tapes of the Raw Power album rehearsals). There was an encore of Bowie’s ‘Fame’. The black leather-clad band (this time sans Bowie, and not suffering at all because of it) included Tony and Hunt Sales, sons of Soupy who introduced the band onstage! 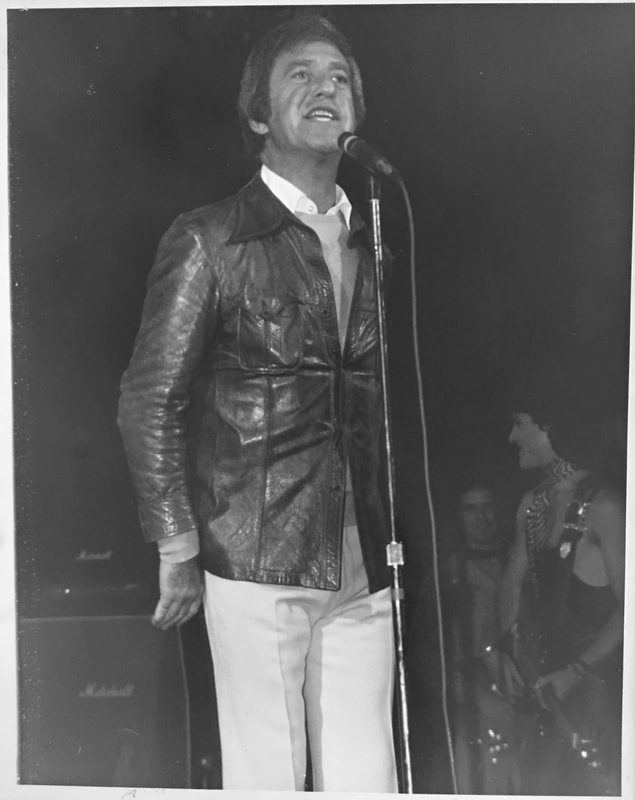 They served as a low-key backdrop for dominating Iggy, slavishly throwing himself around the stage, occasionally dropping to the floor exhausted – the Id foremost as he contorted his beautiful savage face into looks of lust, and at times vacancy. Iggy seemed alone, exposed, giving his all as we stared at his naked torso – stunned as if each of us had received a slap in the face. His small frame seemed larger than life under the spotlights and in the shadows. His body rippled with perfectly formed muscles, sweat and scars from his days of vengeance. Through his movements both graceful and savage, it seemed as if he was trying to break out of his skin, into some nameless freedom. What kind of people attend such an exhibition? Suckers for his affections/ his inflictions? Necrophiliacs? The type who peek through ambulance windows, or those who secretly pull the legs off spiders. The most gratification must have been felt by those who cut worms in half and watch them suffer and squirm. Iggy was doing the same – he was slimy, sweating, writhing and sprawling all over the stage. We left the hall pondering, ‘I loved it – what’s wrong with me? There was not as much violence as in the days of the Stooges when acts of self-hate turned to self-abuse by Iggy. He would physically punish himself while the audience gasped in ambivalence, at first unaware and suddenly realizing own latent needs for punishment and masochism by watching Iggy act out for them. Iggy’s performance still runs along these lines, only now more restrained with indirect hints of violence. Still, Iggy is for real. He’s more than slightly bent, without sense of self-preservation, having more animal instincts than human ones. He is unleashed on us and we love it, finding our lost strength and desires magnified in the bravado of this live wire – the sultan of destructo-exorcism. The show was virtually the same two nights ago at the Palace Theatre in Waterbury CT. The audience were more calm than the manic New Yorkers. Nevertheless, everyone remained in the theater for at least fifteen minutes cheering for a second encore, which never came. Iggy seemed more relaxed in CT, as if this were merely a rehearsal for the big night in NYC. Iggy feeds off the crowd in New York, making it much more than just a performance. Everyone is involved, and we all leave deep in thought, stunned and euphoric.